Few weeks after the success hit of Five Nights at Freddy’s, YouTube was filled not just with staggering amounts of face-cam playthrough videos for the horror title, but if you knew to keep searching you’d eventually hit the teaser video for FNAF2 that the creator uploaded. From the rumors and sources back then, it was teased that the sequel was going to come out on 2015, and a great deal of hype among the cult following began. I had been full of interest and curiosity back then, and suddenly Five Nights at Freddy’s 2 comes out not a month after watching those trailers. I was all surprised, intrigued and strangely wary; wary that it might be too soon for a sequel’s release. For those who played the original, we all know Cawthon did an excellent job with the first iteration, spawning fans in all kinds of venues over the internet; but could the developer have rushed the decision to put the sequel out so soon? As an impatient person myself, I sympathize with the anxiety of having something ready and wanting to share it with the world, but the glaring inconsistencies of the purported sequel’s plot and its badly redesigned gameplay mechanics make it hard to just eyeball the consequences of poor design choices. Five Nights at Freddy’s introduced the simple yet horrifying reality of being stuck at a nightmarish job taking care of a run-down pizzeria wherein animatronic characters freely roam at night, seeking out out-of-costume endoskeletons (humans) to forcibly stuff them into death-trap bear suits. As the protagonist and night-shift security guard, you were tasked with sitting through the midnight shift until dawn, when the animatronics would stop trying to murder you. As the week progressed, the roaming animatronics would become active earlier and aggressive in their intentions, forcing you to step your game up and keep track of them. It was a game about being paranoid, of waiting, of rationing your limited supplies, but above all, of knowing when the creatures were going to attack next and preparing for it. It didn’t matter if you were a master of it or you were immune to jump scares -- fear isn’t just a loud sound startling you. Fear is a feeling of upcoming dread, masterfully represented in the game through the ever-dwindling resources (electrical power) and the stress of managing it all. I felt that Five Nights at Freddy’s 2 took that highly successful formula of manipulation, crumpled it into a ball, dumped it in a basket and then set the entire building that basket was in on fire. FNaF2 is not about carefully managing your resources or learning movement patterns or watching things on cameras and being terrified anymore. It’s about robotizing your movements until you become an unthinking automaton bent on following rhythmic patterns as if you were playing Dance Dance Revolution with your hands on the same track forever. It starts out innocently enough: Night 1 and 2 do a great job at introducing things a la FNaF, plus the new mechanics. The “new” pizzeria doesn’t have doors to close and you don’t have to worry about the light buttons on the walls draining your power anymore. You now have a flashlight capable of lighting up not just the empty corridor in front of your office, but also, somehow, every camera you have access to. This is and will be your only resource for the rest of the night, but managing its battery levels is never the big issue because of two important new features. The first feature is the Freddy Fazbear mask you’re given at the start of the game. By sliding the mouse down on the red panel at the bottom of the screen you’re able to equip the mask, and “everything that wanders in will eventually wander back out” while you’re wearing it. The game tells you who this trick will work on and who it will not, but it does never address how and when it will work; you’re supposed to learn this mechanic after failing enough times or by checking outside sources. 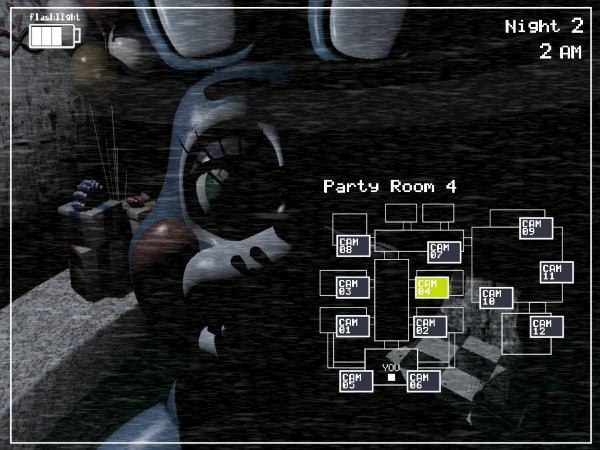 The reason for this is that starting from Night 3 onwards, the old animatronics from the previous game become instantly hyper-active (Seriously destroying the point of the new toy ones, who kind of stop being a threat this way) and attack you very differently from the others. Like FNaF, the new toy animatronics give you a little hint they’re about to attack before you can quickly slip your mask on and prevent being caught, but the old ones simply spawn in front of you and give you less than a fraction of a second to equip your life-preserving mask. Fail to do so in what I surmise is 0.1 seconds and you’re sent back to the start of the night. It was very clever at first, and I respected the diversity of different ways for enemies to attack, but like I mentioned before, the old animatronics completely saturate the gameplay starting from Night 3 onward, causing the game to become less about prediction and more about slipping that goddamn mask on every time you put the monitor down. The second core feature of FNaF2 comes in the form of a single room called the Prize Corner. A special jack-in-the-box animatronic is resting here, lulled to inactivity by a playing music box. This animatronic behaves differently from every other, and if he comes out of his room certain death becomes a reality for the player. To counter this character, one must focus on the Prize Corner camera and click and hold the constantly draining disc-shaped meter in order to wind the music box up; if the music stops even once, the Marionette inside the box will come out. This, in addition to Foxy (who can only be warded off by flashing him with your light), makes it so you can’t abuse the Freddy mask mechanic to get through the night easily. Initially, I thought it was a cool mechanic as well, and the game is nice enough to let you know by flashing a warning sign on screen that the music box is about to shut off, but since the dial’s rate of draining increases as the week goes on, you will be pressed to keep your focus on the Prize Corner more and more, trivializing the need to check other rooms to see what the rest of the gang is doing. Combined with the way the old animatronics plague your game towards the end, this becomes a very big issue. Since the old animatronics pop up in your office whimsically (there really is no difference to who does it or where they come from, from a gameplay perspective) and you have that little window of time to protect yourself, late in the week you’ll be stuck equipping your mask and winding the music box. You’ll alternate between these two tasks permanently while taking your flashlight every so often to stop Foxy from pouncing you. There literally is nothing else to do for the remainder of your horror adventure. It’s not even a horror anything anymore as it boils down to a game of reflexes that punishes you with a loud screech if you don’t maintain your rhythm. I was severely disappointed in how the gameplay evolved. The core aspect of FNaF was to watch those creepy, blankly-staring characters, keeping track of them, making you grow more and more anxious the closer they approached, letting you know you had to prepare accordingly, but this game does not let you do this anymore. It constantly tells you to wind up the music box, largely restricting your appreciation of the work that went into the pizzeria’s design and the characters’ different activities as they roam about. And the once helpful warning sign turns into your most hated enemy as you realize it’s acting like that annoying Sea World tour guide constantly nagging you to move on and stop staring at the pretty orcas in their tanks. “Uh,” I’ll simply answer to that request, slack-jawed and with a vacant stare in my eyes that prove my faith in humanity just dropped a little: “What else did I come to Sea World for?” Now I can’t focus on anything but that music box, and even if the music box is fully wound-up there’s a high chance I’ll be pulled away from the cameras by an invading old animatronic anyway, forcing me to into a tiresome repetitive cycle of: Wind-up, mask up, check vents, flash corridor, wind-up, mask up, check vents, flash corridor; rinse and repeat ad infinitum. “Horror? You don’t have time to be scared, son,” says Five Nights at Freddy’s 2 if it was a condescending supervisor who’s making it his life mission to glare your way with creepy flashing warning signs for eyes. “You have a music box to wind-up.” I did not welcome that kind of pressure. The game’s downfall is the forsaking of its predecessor’s main elements of dread in favor of resorting to cheap jump-scares with the over-saturation of old animatronics and the music box preventing you from being able to change your actions more. If you’re confident in your reflexes and can learn a single pattern, the game’s illusion is over. And what is left after that? To keep winding-up that darn music box. I’d say give it a go and try it out for yourself. Rime Berta IS childish and it certainly IS an inferior copy of what tactic RPG players know and love, and I MIGHT be sounding overly misogynistic with this review, but know that if you want a simple adventure with slow-paced tactics battles and you don’t care about a good story, you might find a place in your heart for this unpolished gem. The developer chose to focus his efforts on a horror and suspense theme and came up with a concept that's stronger than any words I can sum up to describe. Tense moments, the fear factor and a nigh unpredictable AI make for every Night at Freddy's a true fight for survival. Entertaining, engaging and enveloping; once Five Nights at Freddy's clasps its paws around you, it will be hard to let go. Like any good puzzle game, MouseCraft tests the wits of its player by gradually increasing its level of difficulty as the story mode advances. With a solid 80 levels to clear (and more if you use the built-in level editor! ), can you help Dr. Schrödinger realize his dream of completing his mice-powered contraption?